There are many occasions when you need to find duplicate values available in a column of a MySql table. 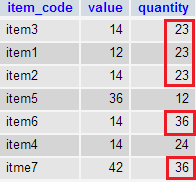 Often, you may want to count the number of duplicate values in a MySQL table. In this article, we have discussed a query where you can find duplicates, triplicates, quadruplicates (or more) data from a MySQL table. We have discussed how to find duplicate values with INNER JOIN and subquery, INNER JOIN and DISTINCT, and also how to count duplicate values with GROUP BY and HAVING. 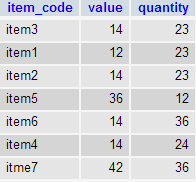 Structure: item_code	varchar(20), value	int(11), quantity	int(11) where item_code is the primary key. Now we want to get the details of those records where quantity field have duplicate/triplicates values. In the image above, values marked with red rectangle exist more than once. You can use the following query to get the same result. Here we apply INNER JOIN the table with itself. As the same quantity value exists in more than two records, a DISTINCT clause is used. The following query count those records where quantity field holds duplicate/triplicates (or more) data.